huge volcanic eruption in Indonesia. There is another impact site beneath the sea that might not yield a K-Ar age because its rocks are too young. The rock of this former lava pool, possibly a fresh-appearing, coarse-grained latite rather than basalt (which is not all that different) should provide an age of 74,000 years by Ar-Ar dating. 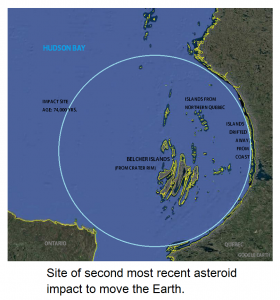 The Hudson Bay (or Nastapoka) Arc, along the southeast coast of Hudson Bay, is the site of the second most recent major asteroid impact to move the Earth. All claims of a regularity of asteroid impacts upon Earth are mistaken. This can be stated with certainty because scientists haven’t yet recognized the largest sites, while others occurred within periods they claim to have been impact-free. My estimate of approximately 63,000 years between the two most recent major impacts is unlikely to be typical of the past. If it were, there would be fewer large land animals left on the planet because of oceanic floods. An inference that might be taken from this is that major impacts are becoming more frequent. This could have been a factor in the extinction of some of the other 20 or so hominid species to have been identified so far. Of these, several are believed to have co-existed until a few tens of thousands of years ago before going extinct. Since they shared a lineage as long as our own, one has to wonder why they died out so recently. The Caribbean region has received much attention from scientists of the United States Geological Survey (USGS) and it was they who determined that volcanic rock underlying sediments in the Caribbean Sea cannot be dated by the K-Ar method. In other words, USGS scientists, by their application of a trusted and routine method of age dating, that had been used to determine the ages of thousands of similar samples every year, inadvertently demonstrated that the rock they were testing is less than about 100,000 years old. They also provided the untenable explanation that it is due to “a special type of alteration” that a date could not be obtained. After a brief flurry of interest in the press in the mid-1960’s, the finding lapsed into obscurity. Today, one may search in vain for its inclusion in any textbook of geology. All too often in science, when something cannot be explained it is hidden, and then it is forgotten. This discovery should have been celebrated as a step of major importance in interpreting Earth’s history, but the opportunity was missed. It has also been established, by a published report, that investigators have dated cores of that basement rock by the 40Ar-39Ar method. The scientists, however, would not release their results because the results did not support their preconceived ideas. An early investigation by the Geological Survey of Canada (GSC) was intended to determine the age of the Hudson Bay arc, as well as to refute repeated suggestions that this was an impact site. It was a low budget affair consisting of a few shallow diamond drill holes on the Belcher Islands and failed in its stated objective due to the limited capacity of the drill that was employed. It is unfortunate that the almost perfect shape of the arc has been deliberately modified on some informal GSC maps. This was another attempt to convince the public that the arc is not the result of an asteroid impact. A drill-core recovered from almost anywhere within the basin would yield a fresh, coarse-grained volcanic rock beneath the sediments, which is below the typical age range of 40K-40Ar dating. Of course, the modern method of 40Ar-39Ar dating would be ideal. The Belcher Islands are Precambrian because they developed out of the crater rim. It is ironic that the Belcher Islands are almost the only place that could be drilled within the entire basin that would have provided rocks of Precambrian age. The only other Precambrian ages that could have been obtained would be from some small islands that floated down from a greenstone belt, far to the north. At Hudson Bay, siliceous rocks from the Canadian Shield were mixed with a denser underlying material. This allowed the rim, which formed from the less dense crust, to float upon the lava pool. There, the rim was folded and distorted by strong currents within the convection cell. By comparison, the oceanic crust at the Venezuelan Basin was more dense than the lava of the lava pool and sank into it. The Belcher Islands, with their spectacular, glaciated drag folds, form one of the most distinctive archipelagos on Earth. If they could be unfolded back to their original form they could constitute the entire missing part of the rim which completed the Hudson Bay Arc. The convection cell was evidently in powerful motion, explaining the exquisite folds that form the islands. Recently, some scientists grudgingly conceded that the Hudson Bay Arc “might be an impact site of Precambrian age” since the rocks in which it occurs are Precambrian. As Allan O. Kelly pointed out, if another meteorite fell nearby today, it would be in Precambrian rocks as well. Scientists from the GSC have claimed in the past that the area “lacks any evidence for being an impact site”, and that “…a major geologic boundary passes undisturbed through the area”. (Scientific American, Letters, November 1990, p.10) Their conclusion was based on the similarity of islands in Hudson Bay with rocks of a greenstone belt that crosses the northern tip of the province of Quebec. The islands were carried toward the lava pool on mantle currents, and until breaking away they had formed part of a greenstone belt hundreds of miles to the north. The islands are distributed down the coast of Hudson Bay, leading GSC scientists to conclude they constitute an undisturbed zone. While the field mapping was doubtless carried out to the GSC’s usual high standards, devotion to orthodoxy prevented any understanding of the islands’ origin. Another proof that we are dealing with a major impact site is the way the Nastapoka Archipelago has drawn away from the mainland. When scientists say they can find no evidence for this being an impact site, it’s because they don’t know what evidence to look for. They expect every impact site must be a big hole in the ground, like the Barringer Crater in Arizona. 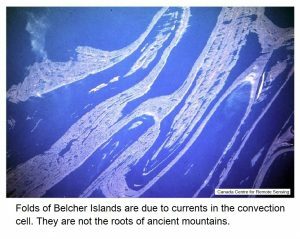 Because the Belcher Islands are of proven Precambrian age, GSC scientists concluded that the folded rocks of the Belcher Islands are the “eroded roots of an ancient mountain range”. When they realize that the impact site was made only 74,000 years ago, they will have to adjust its age on their maps by more than half a billion years. Along the eastern limb of the arc, an elongate archipelago has been pulled away from the coast by underlying currents within the convection cell, traveling only a short distance before the solidifying lava halted further progress. This is a significant confirmation of an impact site where continental crust floats upon denser rocks. 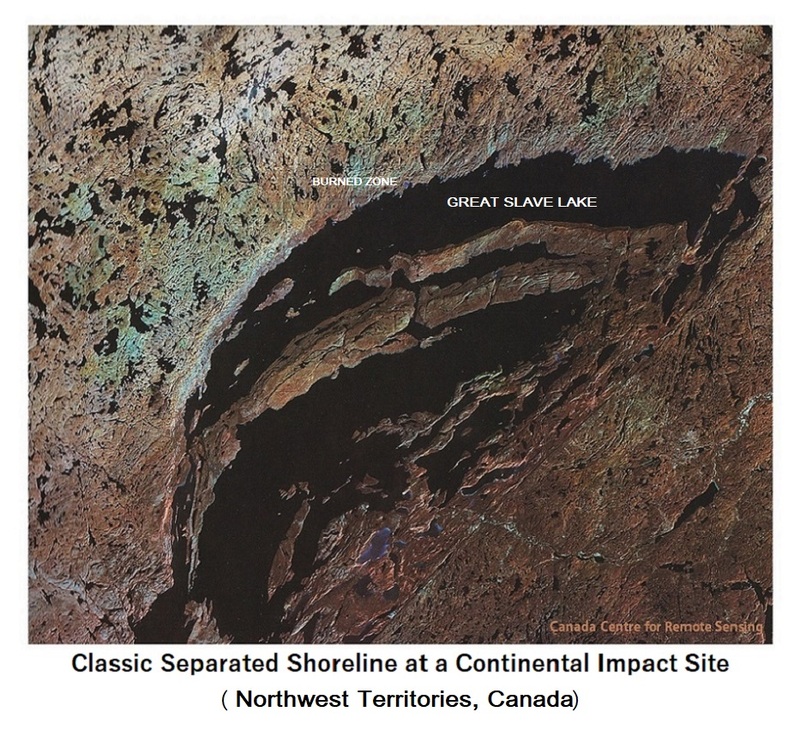 Another outstanding example from the Canadian Shield occurs along the east arm of Great Slave Lake in the Northwest Territories, which is the deepest lake in North America. There, elongate curved islands were part of the mainland until being undercut and moved away by strong currents in the convection cell. 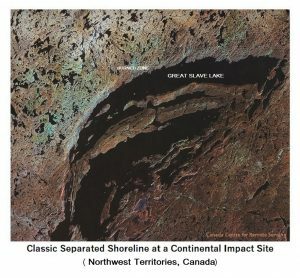 The impact site has been faulted in two, with the missing part occurring to the southwest where it underlies the south shore of Great Slave Lake. It is overlain there by limestones which, notably, hosted rich lead-zinc replacement deposits that were mined by Cominco Ltd. at Pine Point. A feature common to both sites is a ‘burned zone’ along the edge of the lava pool, created when the lava was at its highest level. As can be seen on GoogleEarth, the zone is approximately 5 miles wide at the Nastapoka Arc, and about 2 miles at Great Slave Lake, where the grade is steeper. The formation of James Bay must be closely associated with the Hudson Bay impact, which in turn deformed what remains of a much larger site, the Great Lakes. Parts of northern Ontario appear to have been pushed south, altering a more circular appearance of the Great Lakes site. Until 74,000 years ago the North Geographic Pole was situated east of Greenland, between Iceland and Spitzbergen, as northern Europe lay frozen beneath a massive ice sheet. The Hudson Bay impact moved the North Geographic pole by more than 23 degrees to the vicinity of Prince Charles Island, west of Baffin Island. Devon Island, in the Arctic Archipelago, was left some 13 degrees closer to the North Geographic Pole, and cores of the ice cap there provide a clear record of a sudden decrease in temperature. Ice sheets ending at a sea as in Greenland and Antarctica, are resistant to destruction by oceanic floods, while ice sheets terminating within a continent are vulnerable. Seawater having a depth of several kilometers when standing upon a continent provides such a powerful hydrostatic head that water is forced beneath the ice cap, breaking it up. Drumlins develop in this manner, forming linear deposits of unconsolidated material, frequently associated with bedrock erosion. The North American ice cap, just as the European ice cap before it, didn’t just sit there and melt. Attacked by powerful jets of water thrust beneath the ice, the massive ice cap was quickly broken up. Chunks of stranded ice surrounded by sediment melted, forming lakes, while depressions that filled later with sediment formed northern swamps, called ‘muskegs’. If their surface dried out and was south of the tree line, they became covered by forest. Large ice blocks became rounded in the violent tides and floated down the east coast of North America, a few even entering the Gulf of Mexico, with many becoming stranded along the shore. The origin of the ‘Carolina Bays’ continues to be a geological riddle for some, although their origin was clearly explained by Kelly and Dachille in their book ‘Target: EARTH’, published in 1953. The Carolina Bays formed by fine sediment settling out around grounded icebergs that had been rounded in the furious floodwaters, leaving behind oriented swarms of rounded coastal ponds after the ice melted. Local streams don’t connect the ponds but always flow around them. Small channels are cut through the sandy rims at their lowest point. Consistently parallel ponds along the Arctic Ocean coast of Alaska have a different origin. There, the surface has been scoured by either glaciation or flood, probably both, and low spots fill with water each spring. They can be viewed in high resolution on GoogleEarth. Isotope ratios in ancient ice provide information about sea surface temperatures when the ice formed, as shown in the graph. When Devon Island’s latitude changed 74,000 years ago, from about 69oN to about 82oN, temperatures at the surface of the adjoining sea dropped significantly. Temperature changes are interpreted by ratios of oxygen isotopes in the ice. An increase in a heavier oxygen isotope (18O versus 16O) is taken to indicate higher temperatures since it requires more solar energy to evaporate heavier 18O than 16O. This process has been confirmed under modern conditions. 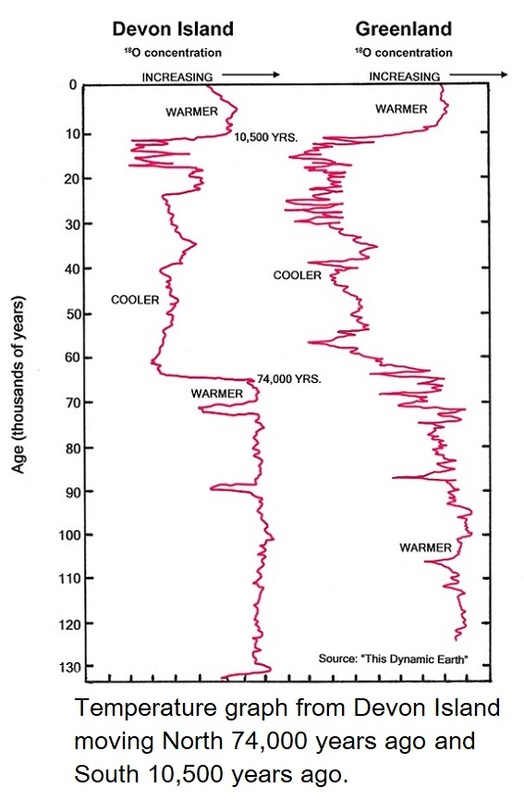 The two most prominent temperature changes indicated on the graph are at 10,500 years and 64,000 years, but the latter doesn’t fit with my provided age of 74,000 years. The older change is so distinct that I can only conclude ice is missing from the section. Those carrying out the study would have had no indication of this. When they had counted down 64,000 layers (years) in the core, they were actually at 74,000 years. 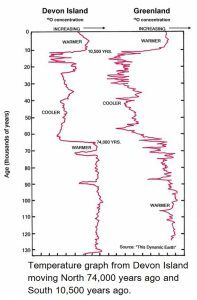 This example is unusual in that the 74,000 yr. age is previously known by other means, but it illustrates a problem in dating ice cores that may be more common than suspected. A change in the pressure of gasses dissolved in the ice provides additional confirmation, as the amount of gas depends upon atmospheric pressure, which is directly related to altitude. This can be affected by the oblate flattening around the geographic poles. The changing conditions took place within the length of time for the axis change to occur which, in this case, was less than a half hour. There is probably no exact relationship between latitude change and the time required for the change to take place. 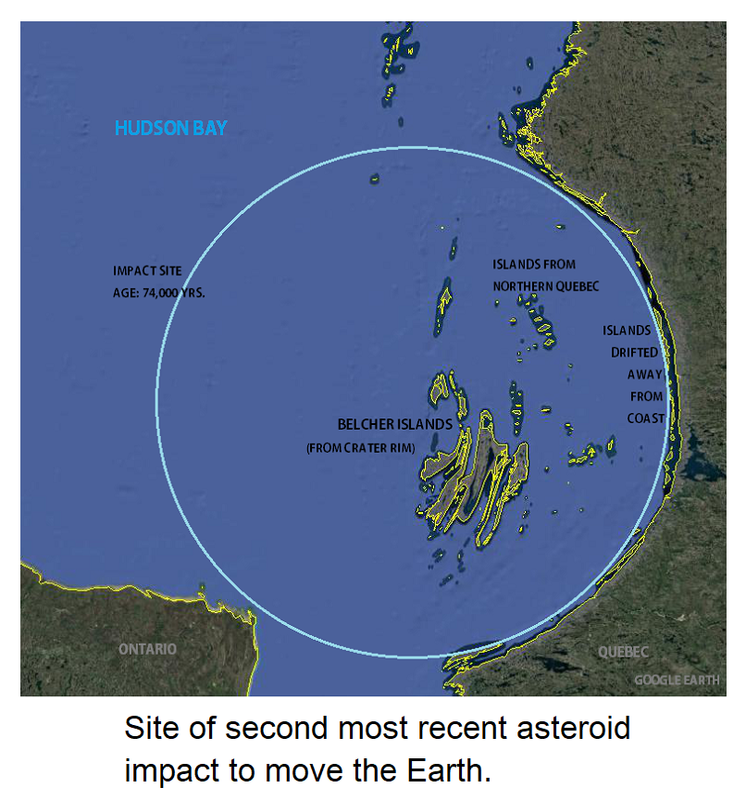 Variables could include the latitude of the impact site, mass, trajectory and speed of the asteroid, and perhaps whether the impact took place on an oceanic or continental crust. The most prominent change in the graph reflects the axis change of around 10,500 years ago. The preceding period of some 63,500 years is the time within which a continental ice sheet formed and persisted over North America, centered about the North Geographic Pole. At the time of the Hudson Bay impact, North America would have been largely free of ice. A remarkable legacy of the 74,000-year flood can be found on Axel Heiberg Island, approximately 700 miles from the present geographic North Pole. The 1987/1 issue of GEOS, a Canadian Government quarterly, describes ‘Fossil Forests in the Far North’. 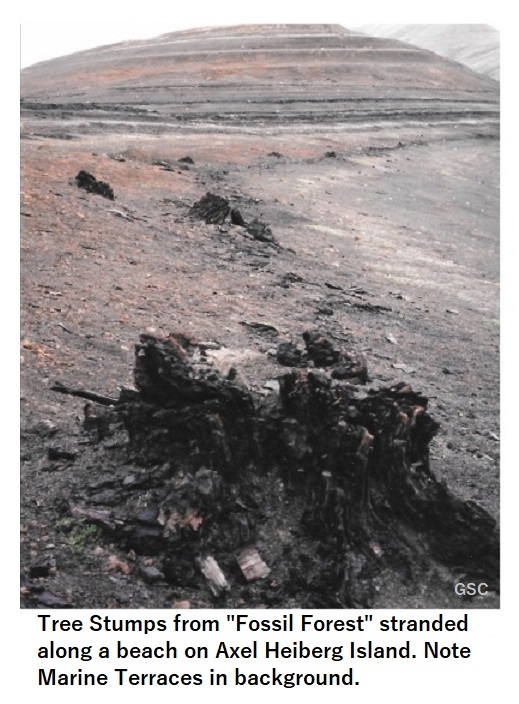 It begins: “Fossil forests are clusters of tree stumps with or without attached trunks, standing as they grew long ago.” None of the attached trunks are vertical, which had to be the configuration in which they grew, but “standing as they grew” does indicate the stumps grew in their present locations, which the article later confirms. It is stated that there is enough solar energy available in the high Arctic for trees to grow there, although none do, which follows the semi-disclaimer “If we accept that the forests were more or less in their present position…” The meaning of this is clarified later by the suggestion that “The earth’s mantle may have shifted significantly with respect to the core.” The matter was not pursued further since there is zero evidence that this occurred, and it certainly doesn’t reflect the belief of GSC scientists. An oceanic flood destroys a forest in stages. The initial attack is by water that can be traveling at hundreds of miles per hour. The water contains all sizes of sediment, including boulders, and shears off the trunks close to the ground, almost as if by a huge chainsaw. The roots are then gouged out of the ground, as the soil is eroded to bedrock. When the lower parts of the trees are tumbled in the flood, most of the roots are removed until only the thickest, well-rounded, and often well-polished stumps remain. The wood is impregnated with silt from being tumbled in the furious flood waters. (i) The roots have been removed, leaving only short, rounded and even polished stumps. (ii) The wood is impregnated with silt. (iii) There is no soil. The last point is especially problematic. Any competent pedologist (soil scientist) should be able to recognize immediately that the present sediment around these tree roots is not the soil in which they grew. The soil that has nurtured a forest cannot simply disappear. The formation of soil horizons entails changes in particle size, mineralogy, chemistry, biology, color, hardness, in fact almost any characteristic one can think of. Bleaching, cementation, staining and all sorts of changes may occur later, but if the trees are still there, and if they grew there, evidence of the soil must be present. These trees did not grow in the sediment surrounding their roots. Even neglecting the impossible distribution of some of the trees, the absence of soil development constitutes proof that the trees did not grow in the sand surrounding their roots. Most of the ‘forests’ reported by the GSC consist of only a thin, dark layer in the sand, containing leaves or roots. The tree boles were gently deposited on a beach and surrounded by a layer of sand, as the Arctic Ocean continued to slosh back and forth within its basin after the flood had abated. The trees probably grew bordering the Arctic Ocean, well south of the Arctic Circle at the time, in a temperate climate, and totally unlike the spacing in which some of their remains presently occur. After having their trunks cut off by the rushing, sediment-laden water the boles were ripped out of the soil and tumbled in the flood, floating upright until grounding upon a sandy beach. Water lapping upon the shore then deposited sand about them and froze. Subsequently, they would be buried by the next oceanic flood, 63 thousand years later, and subsequently exposed by normal coastal erosion during the short summer seasons. The entire fiasco of the ‘fossil forests’ has been totally bungled by the GSC. It would be important to know whether the wood has retained enough carbon to be dated by modern techniques, and whether any AMS (14C/12C) carbon dating has been carried out on these tree remains that were left there 74,000 years ago. Apart from the logic articulated above, proofs of this age are available from age dating of drill cores, wood, and animal remains. (ii) The fossil forest trees should be dated by the AMS (accelerator mass spectrometry) technique that is now available. The tree remains were washed up there following an oceanic flood, about 74,000 years ago, rather than 40 to 65 million years ago (for which no proof has ever been offered). 74,000 years is little more than one-tenth of 1% of the presently claimed age, and the first GSC report even assigned a much greater age that was decreased, without explanation, in later reports. Protons from cosmic rays blast nuclei in the upper atmosphere, releasing neutrons. The neutrons bombard 14N (nitrogen), to produce radioactive 14C which combines with oxygen to form carbon dioxide. This is taken into plants and into animals that eat the plants. Plants and animals exchange carbon dioxide with the atmosphere so that their 14C/12C ratios approach that of the atmosphere. Older carbon dating employed a Geiger-Müller tube to measure the decay of 14C, which has a half-life of 5,730 years. (A half-life of 5,570 years was actually applied because this was the original calculated value.) The age of a sample is determined by measuring the decay of 14C, which may account for only 1 part in a trillion, and comparing this to the quantity of 12C and 13C. Correction curves are required to allow for nuclear testing which added 14C to the atmosphere, industrialization which adds carbon to the atmosphere without any 14C, the slight preference of plants for 12C over 13C and 14C, and a few other occasional considerations. The more modern Accelerator Mass Spectrometry (AMS) Method uses a cyclotron, followed by a conventional mass spectrometer. There is now a significant overlap in the age ranges of some common rocks with biogenic material, and this can be useful in archeology, anthropology, and some modern geology. The cyclotron technique measures only the 14C content directly, which has doubled the sensitivity of earlier methods, even using samples as small as a single seed. The same correction curves are required to be applied. A recent development in oceanography involves an interpretation of how ocean currents, such as the Gulf Stream, operated in the past, and how they may have been affected by water from melting glaciers. The Gulf Stream in the past 10,500 years, however, has been affected by a lot more than fresh water released from melting glaciers. If, as was reported by Kelly and Dachille, some Carolina Bays extend into the Gulf of Mexico, this would constitute evidence that the Gulf Stream was not functioning at the time. Every major impact rings the planet like a bell. Energy waves travel out in all directions, and even on the opposite side of the world, significant gravitational effects take place. 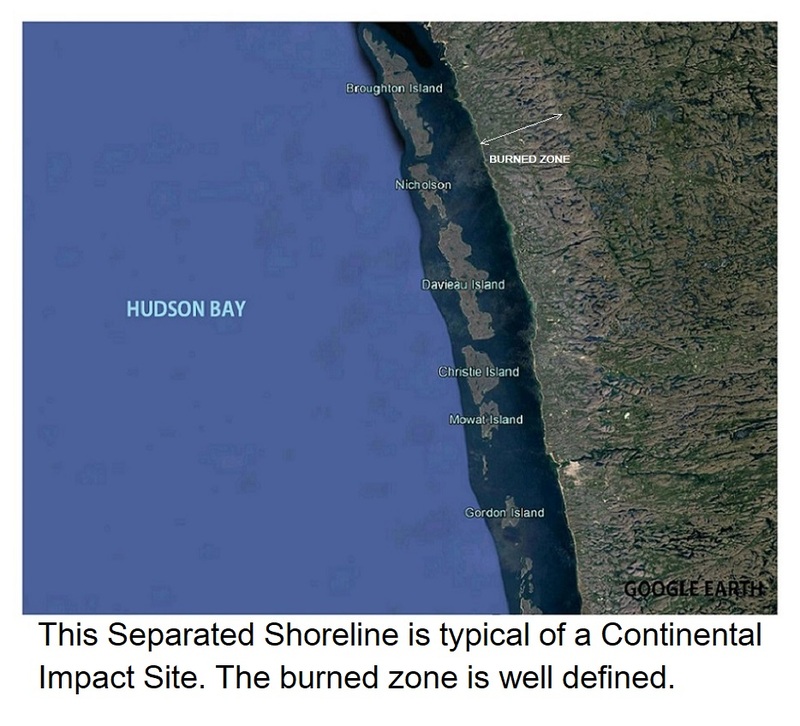 I am positing that within an hour after the impact in Hudson Bay, another catastrophic event took place. On the island of Sumatra, Indonesia, on the opposite side of the globe, Mt. Toba erupted. The first catastrophe is concluded as having been the immediate cause of the second. Sound waves (P waves) travel at around 3.5 miles per second at the surface and would have reached Mt. Toba in about 42 minutes. Shear waves (S waves) travel at around 2 miles per second at the surface and would have taken about 74 minutes. With enough energy, however, shear waves can also travel directly through the solid part of the core of the Earth, arriving even before the surface waves. The Mt. 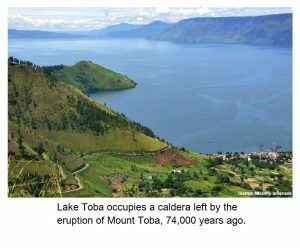 Toba “super-eruption” was devastating by any measure, and the quantity of ash released has been estimated by volcanologists to be 2,000 to 3,000 times that released by Mt. St. Helens in 1980, which was the deadliest and most economically destructive volcanic event in the history of the United States. A major effect of the Mt. St. Helens eruption resulted from a debris avalanche, while most of the mountain remained in place. At Mt. 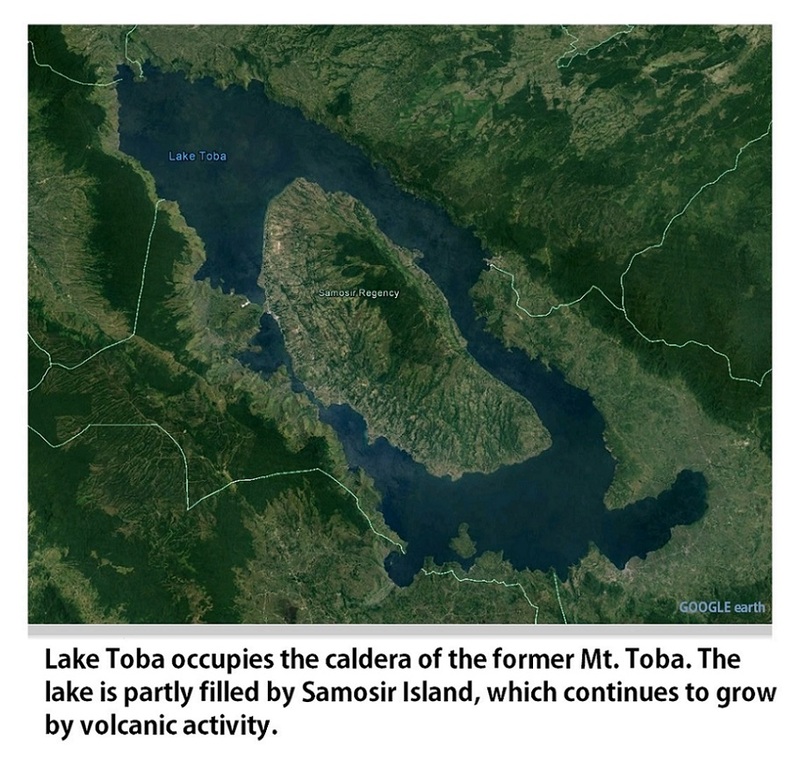 Toba, the entire mountain disappeared, and so much material was ejected that there is now a sunken caldera occupied by a 100 km (62 mile) long lake, with an average depth of 500 meters (more than 1,600 feet). 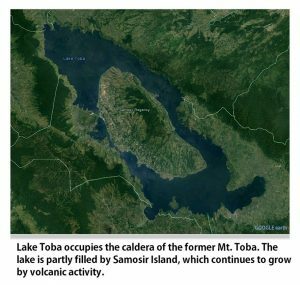 Geologists classify the site as a resurgent caldera, as the lake is already partially occupied by an island that is being formed as new magma pushes up from below. The most recent eruptions have taken place within the last few hundred years, and future eruptions are certain to occur. The major eruption of Mt. Toba is claimed to be “the most accurately determined date from the entire Paleolithic period.” This was accomplished by selecting crystals of sanidine under a microscope, from a coarse-grained tuff (volcanic ash) bed in Malaysia, and subjecting them to 40Ar/39Ar analysis, which provided an age of about 74,000 years. Sanidine is a high-temperature variety of orthoclase feldspar, a rock-forming mineral that is common in granite. No ash from Mt. Toba has been recognized in ice cores from Greenland or Antarctica, although a peak in sulfate concentration from Greenland is suspected to correspond to the eruption. There has been much speculation by anthropologists about a human population bottleneck occurring as a result of the Mt. Toba eruption, which may have led to rapid changes in small, founder populations around the world. The disappearance of Neanderthals was also probably associated with or hastened by, catastrophic oceanic floods. Even if the human catastrophe played out as believed, however, the Mt. 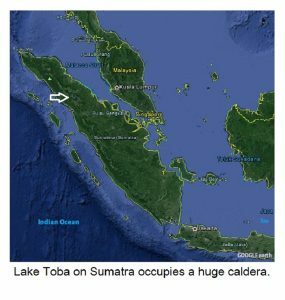 Toba eruption was not solely responsible. If the Hudson Bay impact had occurred at the same time (and if it was the direct cause of the Mt. 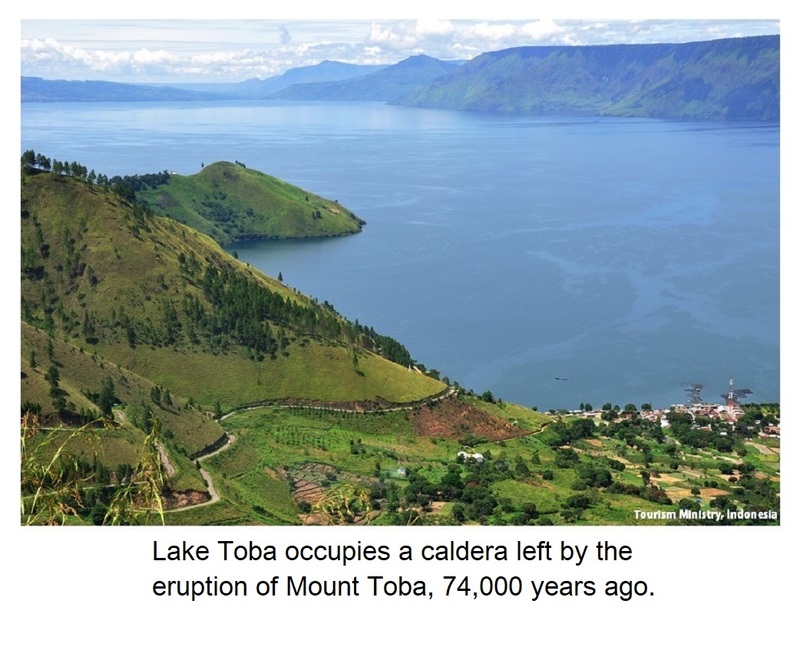 Toba eruption) then life forms all over this planet had a lot more to contend with than a layer of tuff. This isn’t to underestimate the effects of several feet of tuff, which would have been devastating to life in the immediate vicinity of Mt. Toba. Worldwide, however, the effects of an oceanic flood resulting from an axis change would have been much greater. Other supervolcanos are likely to have been set off by the impact of a large asteroid in the past. Although pressures beneath a volcano had to have built up before the impact, their sudden release before smaller eruptions could occur, probably contributed to the scale. A factor of great importance to us may be the way in which the height of Africa above sea level has provided sanctuary when oceanic floods ravaged the world. It has been supposed that only a few thousand humans existed in Africa at the time Mt. Toba erupted. Earlier emigrants from Africa who favored coastal areas, especially in Europe, whose interior lay beneath an ice cap, would have died in the flood. In evolution, timing is everything, and once more, our species might have gone extinct. The problem of scientific specialization shows up clearly when an ice core from Greenland or Antarctica is examined, and scientists conclude from it that the world entered a period of warming or cooling. 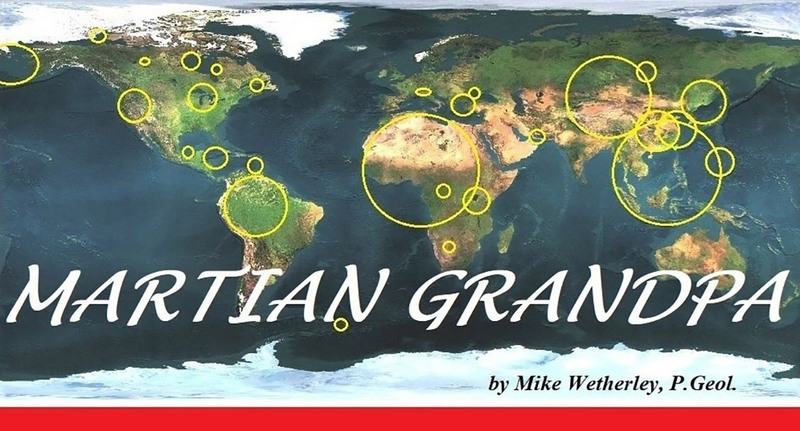 For example, at the 74,000-year axis change, northern Greenland was moved closer to the geographic North Pole, as well as to higher elevations above sea level due to flattening at the poles, while southern Greenland was moved further south. Sudden temperature changes recorded in ice cores confirm that this axis change occurred. The remains of crocodiles in the Arctic, coal in the Antarctic, and evidence of glaciation close to the present equator have all been accepted as proof of past climate change. What they really provide is proof of past axis change. An understanding of axis change is going to lead to an altered view of Earth’s geological history. It will be recognized that every part of Earth’s surface has existed in the tropics and in the Polar Regions numerous times and that significant changes in latitude have taken place within the memory of humankind. Age date trees from the fossil forest by AMS method. Compare these to ages already obtained for mastodon remains elsewhere in the Arctic. Compare these to ages of sudden temperature changes recorded in ice caps. Compare these to ages of tuff from Mt. Toba, already determined with high accuracy. Drill Hudson Bay Basin, and date the bedrock by the 40Ar/39Ar method. Have competent observers investigate the tree boles of the “fossil forest” for proof they were tumbled in a flood, and the sand beneath them to confirm the trees did not grow there. The most recent impact of an asteroid to move the geographic poles of our planet occurred about 10,500 years ago, while the second most recent impact to achieve this result occurred about 74,000 years ago. 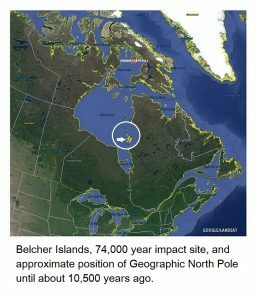 North America experienced the build-up of a continental ice sheet which persisted for roughly 63,000 years while the North Geographic Pole was situated in the Foxe Basin, at about Prince Charles Island, some 500 miles north of Hudson Bay. Before then, the North Geographic Pole was situated in the Greenland Sea, and the only part of North America within the Arctic consisted mainly of Baffin and Ellesmere Islands. The North Geographic Pole may have occupied its Greenland Sea location for only a slightly longer period, for which my guess is about 76,000 years. (See: #7. The Mediterranean). Throughout that time, a major part of Europe was covered by a continental ice cap. Parts of the present Arctic and Antarctic circles have occupied lower latitudes over the most recent axis changes, during which their climates varied from polar to temperate. Parts remaining within the present polar circles for at least the past three axis changes now contain the thickest parts of the ice caps, as seen in northern Greenland and East Antarctica. Canadian geologists have wondered why ice in the Canadian High Arctic moved north, but before the last axis change, it was moving south. Data from the Vostok hole in Antarctica suggests that this location has remained within, or close to, the Antarctic Circle for the past 400,000 years. This is remarkable considering that several additional axis changes have probably taken place within that period, as indicated on “The Doomsday Graph” (See: #11. Climate Change). Sharp peaks of atmospheric dust on the graph are indicative of major catastrophes that were possibly associated with additional axis changes. The almost perfect arcuate shoreline of the bay. The contorted shape of the Belcher Islands. Other islands moved from northern Quebec by mantle currents. The Nastapoka archipelago that has moved away from the coast. The light-colored burned zone along the coast. The proximity of James Bay to the impact. The rock type underlying the basin will be something like a fresh-appearing coarse-grained latite and will provide an age-date close to 74,000 years. 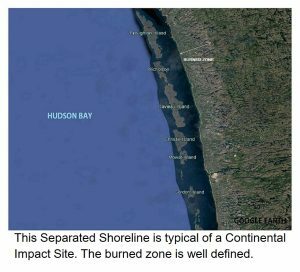 When Geological Survey of Canada scientists claimed that southeast Hudson Bay lacks any evidence for being an impact site, I have to wonder what sort of evidence would be acceptable to them. What is not acceptable is to deliberately distort the shape of a coastline on a map, or explain away islands that were distorted as they floated upon a lava pool as constituting the “roots of an ancient mountain range”, or to draw an imaginary geological boundary around alien islands that have journeyed there on mantle currents. Catastrophism predates uniformitarianism, but catastrophism has been denied for so long because, in part, it was considered to carry religious implications. For this perception to find support through actions of ‘The Geological Survey of Canada’ is disappointing. I should have stated that the diameter of the lava pool would have been about 470 km, while the mass of the impacting asteroid was probably somewhat less than that which occurred some 63,000 years later at the Venezuelan Basin.